In recent years, interlock pavers have become a popular choice for driveway surfaces. Its versatility, durability and longevity are amongst some of the benefits that comes with it. 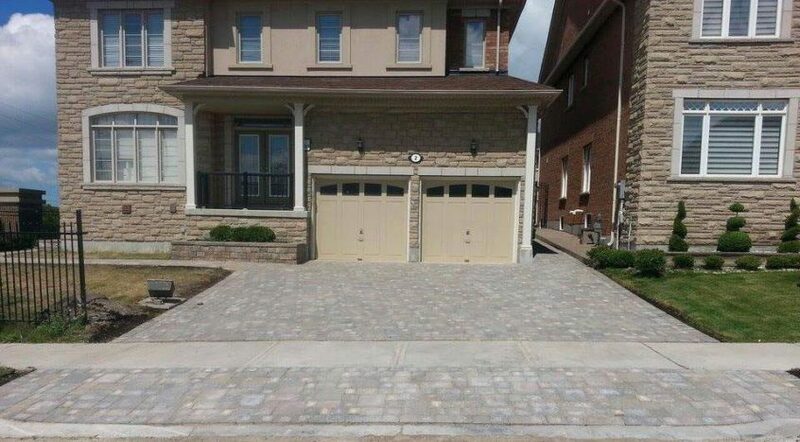 But how does interlock compare against asphalt driveways in Ontario? With our defined seasons, it is important to install a material that can withstand the hot summer days as well as the harsh winters. 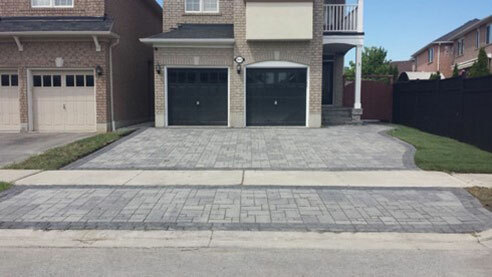 Below is a comparison between interlock paver and asphalt driveways in particular for Ontario properties. For a comprehensive look at the benefits of concrete versus asphalt driveways, click here. Both interlock pavers and asphalt has its pros and cons. Depending on your priority – budget, style or durability – it will be your deciding factor of which material to pave. Asphalt requires the least initial investment when it comes to driveway paving. It is the most economical material available. However, the cost to maintain and repair surpasses all other choices. With interlock pavers, it may have a higher price tag, but the cost to keep it looking as great as it was first installed is minimal. Interlock pavers come in all different shapes, sizes, colors and patterns. This allows for endless design possibilities for homeowners to express their personal style. Asphalt, on the other hand, only comes in black. Newly paved asphalt driveways need to be seal coated within the first year of installation and every 3 – 5 years after that. The purpose of this seal is to protect it from the sun’s UV rays and also moisture. If moisture penetrates the asphalt driveway, it will create weak spots that may lead to problems in the future. Asphalt requires the highest level of maintenance amongst driveway materials. Interlock pavers do not require much maintenance after it is properly paved. Aside from occasional power washing and refilling of polymeric sand to avoid weed growth, it does not demand further attention. Asphalt driveways are susceptible to cracks caused by the expansion and contraction from the cold, harsh winters and the blaring, hot sunny summer days. To repair potholes, cracks or patches of sunken asphalt (caused by settling of the ground after the driveway was surfaced with fresh asphalt), it requires a whirlwind way to patch it or sometimes repaving will be needed. However, since interlock pavers are individual pieces, repairing is easy. 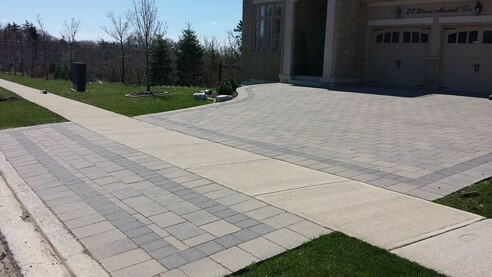 Simply remove and replace the unwanted paver and your interlock driveway will look brand new. With Ontario’s extreme temperature, asphalt driveways last around 8 – 10 years and will have a degree of chips, cracks and fading of color as the years pass. Interlock, being one of the strongest driveway material, has a lifespan of 20 – 30 years. Pavers may incur a higher upfront cost for the installation, however, with its low maintenance, ease of repair, durability and unique design options, it may well be worth the investment. Interlock not only adds curb appeal but will increase your property value. If you want to learn more about interlock pavers, read our article “All You Need to Know About Interlock Pavers”. 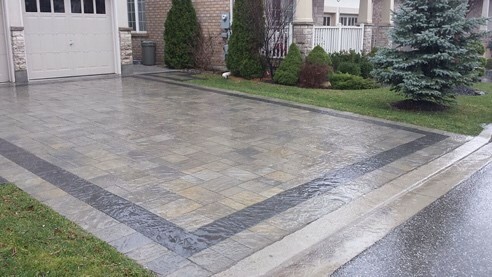 At Markstone Landscaping, we have specialized interlock paver installers who have years of experience in producing unique and durable interlock driveways. Our well defined process allows us to deliver our services in an effective and transparent manner. Call us today for a free consultation & estimate and let us create the interlock driveway of your dreams.